Emails subject lines reveal what an MBA program believes is important marketing content. From the University of Dayton, that includes 46 subject lines from August 17 to February 22. 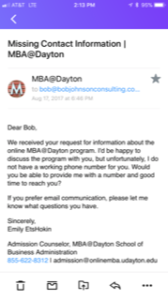 For newcomers… this is the 4th installment in a series reviewing email recruitment communications and social media presence from 4 online MBA programs: American, Simmons College, Syracuse University, and the University of Dayton. The introductory post is here. The 2nd installment reviewed the opening emails from each school. The 3rd post reviews American University email. Notes: Through October, most emails are program event announcements and reminder emails. A financial aid webinar appeared in October and the first (and only) scholarship email arrived in November. Webinars to introduce students and the MBA program director arrived in January. February saw the first use of a webinar to help applicants writer better admission essays. On balance, it seems as if the recruitment emails for the April cohort indicate an expansion of recruitment content. Unlike the American University sequence, none of the webinars feature MBA faculty. Expect a continuing review on an irregular schedule of the email content from each online MBA program, followed by comparative notes on the online inquiry forms, and individual notes on how the schools are using social media. Next up: Simmons College. Join 601 people on the Top Tasks: Higher Education Website Content group on LinkedIn. Request membership here.